We're still trying to sell our property, that's why I don't want to lash out too much if I can help it. There is a warning somewhere on ebay (and I think I've linked to it here before) about cheap stoves with fake ce plates etc. 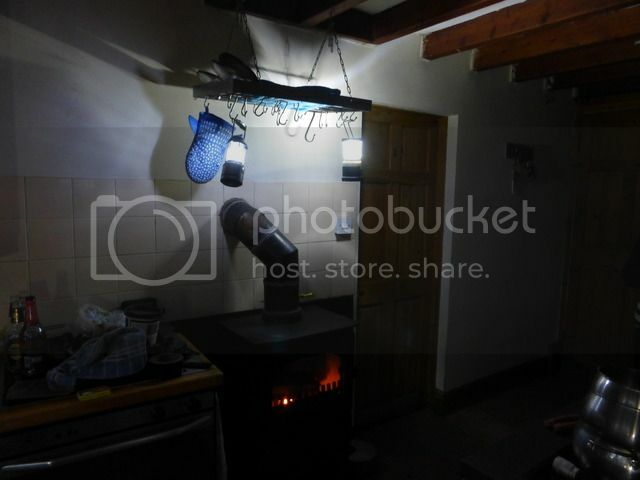 I bought a cheapy, but from a reputable shop that also sells expensive stoves. I've not used an expensive stove so I can't compare, but I've no complaints. It's been my only heat for 4 years - runs 24/7 over winter. Had to replace baffle plate last year - new part was in stock, no problem. If that is your reasoning Bodger,possibly a compromise would be a 2nd hand branded make,my neighbour picked up a nice Hunter on e-bay for �150,surprising how many people take them out when they realise purchased wood is not cheap and cutting your own is hard work. When I was looking for one I was surprised at the price of some of the branded makes,a lot on here recommended Clearview,but I ended up getting a Parkray,with all the same features at a 1/3rd of the price. I looked at loads of different makes but found the cheaper Chinese cast iron ones very light compared with other makes. I've been going through the adds on E- bay for a couple of days now, second hand is a definite possibility. On Monday, we intend visiting a couple of the fairly local stove showrooms. Up to St Asaph and then cross country to one in Oswestry. As long as the seals are good, that model could do for us nicely. We have a chimney that draws a heck of a lot and that's in spite f us having installed a a baffle in the flu pipe. We ended up getting one of these but for �750. We couldn't be sure about the quality of the cheaper ones and we've had the 5 KW version of 7 in the study for a number of years and we really rate it. An added bonus, is that the pipework that we have for the one that we're taking out will fit the new one exactly. Its quite a saving. Yes we can use the inspection hatch and the baffle in the pipes. Probably close to 200 quids worth. That's a nice looking stove Bodger. tell me will you keep 'pretty logs' in the base never to be used? Don't know how much of the heat goes downward, but always a good idea to finish of drying the logs to be used next by the fire. This does preclude using 'pretty' logs though. We've have a Highlander 5 with the log store in the study and yes, you've guessed it, I'm not allowed to burn the pretty logs. The ones that we have in situ at the moment have been there for at least two years. when we got our first log fire we were all excited and na�ve. I carefully arranged the wood to look nice in the store we had made. after a few days of loading it up we realised it was pointless. we have a nice one in one of the lounges with a base store. it does get warm ish and dries the wood off but is reserved for the visual effect too. We managed to get the new stove fitted just in time. At half past four this afternoon, the lights flickered a few times before we had a power cut. I used the top of the stove to do myself a romantic dinner by lamp light, of eggs and mushrooms on toast with some obligatory brown sauce. The electricity came back at about seven. My dinner and the stove was and is absolutely brilliant. Its blowing a right 'Hooley' here and the stove is proving to be very controllable and responsive. We nearly had hot dogs. it was probably uncomfortable and dangeroos but he thought it worth it even though those that knew him laughed a lot when they saw his new do. We bought a flat topped fire so we could use it for cooking. Generally I use it when I am doing something that needs a long time, like bolognaise or cassoulet. I also melt wax in a water bath over it, as it takes such a long time. In emergency, such as power cuts (we have a gas stove, but it doesn't work without electricity), I do any cooking on it. 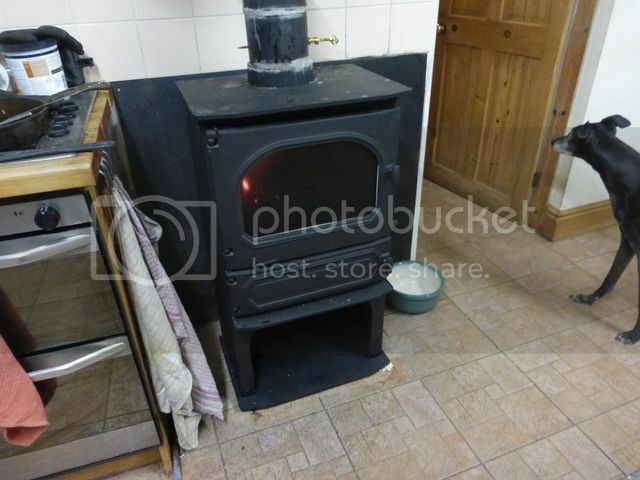 As we use the whole width of the fire box, I don't rake the ashes to one side to do bread etc. as some do.